Sony announced two new smartphones at the MWC this year, part of the Xperia NXT lineup – the affordable Xperia U and the high-end Xperia P. Today we got their prices for you. Not really a surprise but it’s worth noting that just like the brand Sony Ericsson, its website www.sonyericsson.com is no longer in existence. Entering that URL now directs you to a brand new website: www.sonymobile.com. 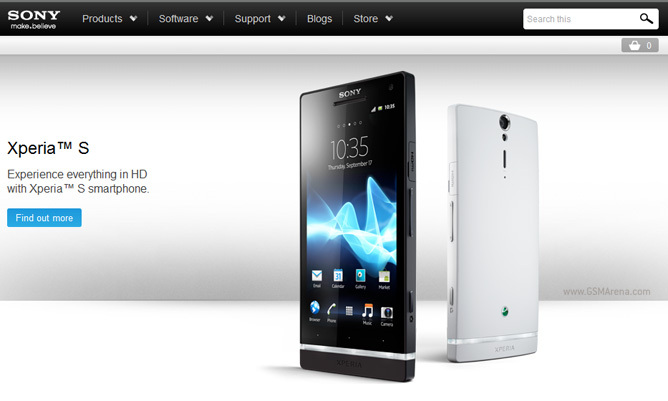 Now the Sony Xperia S is on our home turf. It’s a huge leap forward compared to Sony Ericsson phones – it’s all dual-core processors, 12MP still shots and FullHD videos. We had a bit of free time, so dragged the Xperia S right in our studio for a quick hands-on video. The Sony Xperia S (along with the US-centric Ion) is the most powerful Sony Mobile phone (formerly Sony Ericsson) to date, with two 1.5GHz Scorpion cores, Adreno 220 GPU and 1GB of RAM. Just a week ago the Indonesian equivalent for the American FCC posted the retail name of the Sony's ST25i Kumquat a.k.a. Xperia U. Today we find another retail name in there - the LT22i Nypon's. Sony LT22i Nypon should be called Xperia P when it is launched. It looks just like the Xperia S, but is based on NovaThor U8500 chipset and its screen and camera are less impressive than the Xperia S ones. CES 2012 marks the end of Sony Ericsson and the birth of Sony as a leading smartphone maker. 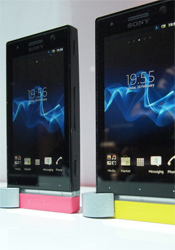 The first two Ericsson-free smartphones are the AT&T-bound Xperia ion and the international Xperia S (previously known as Nozomi) and they both look worthy of the occasion.